Do you consider yourself to be a “crazy cat lady”? I do. I am crazy about cats; love ’em, love ’em, love ’em! I only have one, but I would love to have 10 – if I had the time to take care of that many. But I talk about cats so much that people often call me a crazy cat lady. I take it as a compliment, and just grin. Crazy Cat Lady or Fabulous Friend to Felines? There are a few other definitions of what a “crazy cat lady” is. One says that it is a single woman who dotes on her cat or cats. Ok. But does she have to be single? Another says it is a woman who is “romance-challenged”, or too busy for romance because she is on “the career path”. In that case, who better than a cat for company? And then there are people who just like their pets more than they like people. In that case, isn’t it nice that those people have a nice, sweet kitty to share their life with? And then there is the cat hoarder. These are the people you hear about on the news, the ones that have an excessive number of cats kept in filthy conditions; far more than they have room for or can properly care for. But guess what? There may be a reason for that behavior. Recent research indicates a link between the parasite T. gondii, which sexually reproduces exclusively in cats, and numerous psychiatric conditions, including OCD. The compulsive hoarding of cats, a symptom of obsessive compulsive disorder (OCD), has long been associated with “crazy cat ladies”. 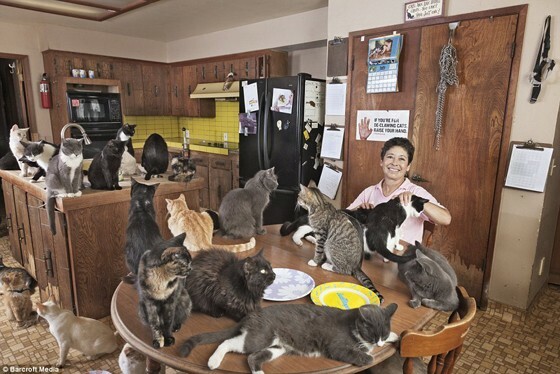 Mass media has drawn on this stereotype to coin the term Crazy Cat Lady Syndrome to refer to the association between T. gondii and psychiatric conditions. Not quite sure if I understand the connection. Maybe the parasite in the cat transfers to the human and causes them to become OCD about having lots of cats in the house? The way I see it, as long as you’re taking good care of all your kitties, staying within the law about how many you can have, and keeping your house and the litterboxes clean, whose to say you’re crazy? Except maybe in a good way! This is probably more cats than I would feel comfortable with. What about you? The same here, but to each their own! I guess the word has gotten around. So what do you think? What’s a good number of cats to have? Have you ever been called a crazy cat lady? Do you know someone who is? We had 4 once; only one now…. Two is probably better per the cats! You have a houseful, Gina-Rich Martorana ! Good to know about the Fresh Step crystals! yes and proud of it… but only have 2 ! Well, I had 2 but then a really pretty cat had a litter of 6 in my back yard this summer. then 2 kittens died so I took mama and the remaining 4 kittens in so now I have 7 cats. But my garage guy said he has 9. I have 9 (did have more, but 1 got shot and some killed on the road and some just came up missing) that go in and out, but stay in at night during the hard winter weather, and got about 5 strays that come to eat also!! I figure they cost roughly $50 a month, allowing for those medical emergencies that can arise during their lifetime, so 2 is my limit. If money was no issue, then I would use the number of interior doors that could be used to segregate them, should a need arise. One can NEVER have enough kitties!! Yes,I’m one,but never been called one to my face,anyway! I’d like to have a house full,all colors and all boy cats ! They are more lovable! I’M 1 AWAY FROM CRAZY CAT LADY, I HAVE 5. Independent Feline Advocate. Have five and one missing. A six pack is my limit. Spent three hours with about 30 shelter cats today. Only 2 now but I have had 9 at one time. I only have one cat, but would have more I were allowed. Had 3 am down to 2. I know not of what you speak, this cat lady!!! I have 5 boys inside, 4 of which were once feral. I also have about 20 outside feral that I feed and provide shelter for. Some have been neutered and we’re working on catching more. I know several crazy cat ladies, of which I am one…..we all work at or for shelters, and rescue, and have multiple cats, around whom our lives revolve….and we are happy, and don’t care what anyone else thinks of us !! Uh … one cat is definitely enough for me!! I am the crazy cat lady. only have three, but would have many more if I could. Jennifer, I understand you completely and also considered myself the “Cat Woman”….there is a sad story that follows but I will always be an animal lover….. I appreciate what you do !! Cleaning liter boxes and hairballs is not fun and getting scratched and sometimes bitten….but we do it all for LOVE !! Not many people understand our feelings or dedication !! I currently have 5 (plus those that hang out outside) The craziest I ever got was when I had 16. Yep!! I’m a crazy cat lady, for sure. Jennifer your a wonderful person to help so many cats. There should be more people like you. Even if you can only have 1 at least your helping that one cat. Thank you for all that you do. By the way we have 5 and I love them so much. I don’t know what I’d do without them. Am a crazy cat lady. I have six. One outside, 5 inside and 2 dogs. People call it my zoo. (I also have a fish tank… love them too). Oh yeah, and all the birdies that chatter at me when their feeder is low! We have 4 indoor kitties! Three would be my limit. Our city actually has an ordinance that one cannot have more than 3 dogs/cats at the same time (NOT the reason for my limit of 3). I would think this would be hard to enforce, though. I have been called a “cat lady” & only have 2. The person tried to back out of the insult but I took it as one & knew that was the intention. I told them 2 cats do not qualify as that! Yes I do how about it Norma? I have 10. Rescued,bottle fed, a stray who had 6 kittens, ( found homes for 4) 1 found on the street and one in our woodpile. I am indeed, the most at one time was 11. IF I had money I’d have more but right now I’m down to 4.
we have four in and four out that are strays. 7 here all rescues. Including the 2 dog who know cats rule. I think there should be at least 2 to keep them company. I usually have 3 but I have 2 ferals also in the back yard that will stay with me for their full lifespan. I am and very proud of it. That definitely would be me; I would be one of those kitty hoarders …if it weren’t for my husband who somehow tolerates the few kitties I have. Every cat has a different personality. When it comes to feeding time, all bets are off. Keep those litter boxes clean! Jennifer you are a special person! You’re doing great. But…ouch…$$$$$ Where do live? I am here in the Los Angeles area and we have a great place that TNR for free. Have you checked if there is one available near you? Live in north central Texas, the next county over had spays for $20 in June limit four but you had to make appointments…never know if you will catch any or not. Last time I put out a live trap I ended catching a big fat possum 🙂 he was relocated to a country road outside of town. Right now it is pushing 100 degrees too hot to trap anything. Have had some unexpected medical expenses come up…me, my son and one of my inside babies. I have 26 very happy cats!!! I have 2 now, at one time I had 9, all but one were related.We took them in for shots 2 by 2, it was funny.I love kitties. I once had forty cats and now I have eight. I love them as my own. I have 3. Am down from 4 as we had to have our senior cat put down last August (she was 14 1/2 and had renal failure, she was a special needs cat as she had deformed front paws.). Three seems to be a good number, but I still get called the crazy cat lady by my family! “Let’s see I have 14 of my own cats plus I have a cat rescue so I have 13 cats in my rescue waiting for adoptions and 2 I am fostering for a deployed solider which makes a total of 29! And I love every one of them. They are all very well cared for, happy, healthy and loved. My house is very clean and does not smell. I am proud to be a Crazy Cat Lady. <3"
ME!!!! 16 rescued ferals! Ages 1-7! We have seven in the house and two outside. Yep I am a crazy cat lady. I currently have 8 in my house but take care of 15 feral cats and kittens at an abandoned gas station I use to stop at. I have 2 and my family calls me the Fairy Cat Mother lol. yes I have been called the crazy cat lady. I have 6 insides,and 8 outside all strays and feral all fixed. very friendly. Not as crazy as some but I have 3. Would love more. They don’t have to call me that, I know I am. I have 3 and that is a good number for me. One is not enough but 3 is enough to give all individual attention. 2-3 is a good # as far as food & medical cost are concerned, but I reached my limit at 5 now when I couldn’t turn the last 2 away. Homeless & starving both of them so my # grew. I love this, what about you. I have always had 4 – thru the last 37 years; I have rescued them all from shelters, 4 cats in the house was a good number for me. I can’t do more than 3 cats, just too many. I love cats, but there is a limit! I have 3 cats, 2 are mine, one is my sons. I could do with only one of them, my favorite guy Jinx. I take good care of all of them, and they are happy. My oldest one is Boo, she is half blind, she is 9, Garth is 8 (my sons cat) and Jinx is 7. They call me crazy every day, so much so that it gets to me now. 18 fabulous felines in my home. I just go through the line over and over again. I bought 480 cans in the last 2 weeks, it was on sale. I only have 2 cats at this time but I aspire to be a crazy cat lady! Have 6 indoor kitties and atleast 4 ferals i feed every night. let them say what they will, some people just enjoy saying mean things, why i’ll never understand…if other people only helped and took care of their OWN to begin with..we wouldn’t have this overpopulation of cats! i myself have only 4, i get called a crazy cat lady anyway (just a joke? of course)…i found 2 of them on the streets..and many before them that way throughout my life…have loved them all with all my heart!! !…BLESS the full time rescuers.. with hearts and houses full of cats (or any other needy animal) love & compassion.. who are willing to give SO much time, money few have to spare, love & care to all the strays, ferals, unwanted, discarded ones by people who turn their heads, then name call..i understand it can get overwhelming for some (when they’re trying to help the ones others abandon!) and can turn into a hoarding situation which we all know is not healthy for them or the animals, but there are many who take VERY GOOD care of many animals and it makes me mad when people say negative things …i thank u <3 not everyone has what it takes….i always say if crazy cat lady means i'm crazy about my cats the yeah i am one! Yes, I do. You say Crazy Cat Lady like it’s a bad thing – lol. Yes, I have been called a crazy cat lady. I have adopted 8 strays. I love them so much, and I would have more if I could afford them. I love dogs also. I think I need a farm. Then all would be welcome. A proud and loving Crazy Cat Lady. A good mom. My vet told me 6 is the cut off (she has 6!) I had 6 but am now at 5 leaving room in case someone needs me. I only have 11 cats and kittens inside Jennifer. And have 4 outside. I have 5 and the above pic looks like our one room apartment. We are happy. I personally know a Crazy Cat Lady very well. This is an all to familiar sight at our house. Most of our cats have come a knocking . . .
Love cats I could be a crazy cat lady. i am a crazy cat lady,i have 20 indoor babies,ages from 6 months to 14 yrs old…plus 4 dogs….love my babies…. I consider my self a crazy cat lady and love the title!!! I am a responsible pet owner and make sure all of my fur babies are “fixed” and vet cared! Adoption of another kitten would solve this kitty’s problem. Cute but kind of sad, too. I too am a crazy cat lady with a sanctuary called Catazona where I care for 78 cats. At one time, I had 115 but health concerns are forcing me to close. You can check all of us out on our FB page and see what everyones up to. Someone dropped a cat off at my house on Halloween, now she is expecting babies. Oh…. What to do….I don’t want any cats. Please advise. I had a beautiful feral cat, she got somewhat tame, but not like other cats, most beautiful cat ever. just 6!!!!!!! and we love them!!! This makes me want to cry for some reason. Look at thoses Cute faces !!!! She shouldn’t have been out in the first place. yes I am a crazy cat lady. I have 16 kittens alone plus all the adults. they are all barn cats plus I have 3 in the house. the 3 in the house I consider rescue. 1 I got from my brother-in-law who found her in his tree and there dog had other plans so they gave her to me, my 2nd was rescued at work, she was a kitten and was in the ally way, she would not eat so I brought her in the house, my 3rd I found in the machine shed as a baby. I feed him by bottle and now he is 25pds and lets me know he’s the boss. he also lets his 2 sisters know he maybe the youngest but he is the biggest of the 3. they are all my babies. I could see myself as this lady. Love cats. yes, by my kids but they forget they are the ones that brought the kittens home and left them with me when they moved out. So they are now my 3 boys from my 3 boys. The number 3 is the Holy Trinity. Three is the most I ever had in my house and sleeping in my bed with me . . . it is the magic number. That would be me – however, I only have 3 right now. This is our three-year-old, Miss Precious when she was about one year old. She was dumped near our house, and came to us on Sunday, July 31, 2011. Our front door was open; she meowed very loudly, we opened the door, and she has been here ever since. aaawwww… it’s hot out there…let the baby in……her “tootsies” are hot…..
Our sons call me a crazy cat lady but we just have 4 right now, we rescured Wendy and could not leave her daughter outside as the weather was gtting colder, so my husband brought both of them inside to live with us and our 2 other cats all but Mikey have been rescued, we did adopt Mikey but his mother was rescued from the south hifh parking lot or yard, by our older son’s senior senior English Teacher. 2 is perfect for me, one hand for each. I have had up to 8 and I have been called a crazy cat lady. I just have one, now and that is purrfect as I’m trying to live on disability. I just love her so much. Judy L Hartzheim is, I have never known anyone like her. She has a cat walk built on to her house so they will all be protected. Wonderful person she is. I use to rescue cats,before our income took a major drop.But always kept a limit of 5 so that I could give them the good care they needed.Close to 70 & husband in 70s so the limit is just our 2 srs. Lili 20 & Bastian 18. Destiny, I can picture the clerk cowering, lol. But I’m glad she got the food she needed! Michelle, you are not really crazy, you are a good-hearted person. There are plenty just like you – read these comments and you will see! You are not crazy…you just have a very big heart! I am right there with you! Thanks! I know I am not like most and I am OK with that. I have around 30 cats that live in my home at this very moment. About 95% of them have been rescued or shown up on my door step from off the streets!! someone has to love them and care for them cause nobody else will!! Call me crazy but I wouldn’t give up a single one of them. I just wish I had some acres to fence in for them.